Disclosure: I was sent a sample from the vendor in addition to a promotional item in order to write up an honest and thorough review. All views shared are mine and mine alone. "Discover how GE reveal® light bulbs bring out colors & patterns that can go unnoticed. Use these enhanced full spectrum light bulbs for your home lighting makeover & see the clean, beautiful light transform every room." When it comes to your house, do you have a specific room that everyone gathers in to spend time? Back when we were looking for houses 8 years ago, my wish list of things I wanted in a house was a large common area for family gatherings. I fell in love with an open floor plan, and when it came time to buying a house, we ended up going with a post and beam house, that had an open dining room/living room/kitchen on the main level of the house. At the time we didn't have children, so our gatherings included our friends and family and their children for sporting events, holidays, game night, etc. The first time we had people over for a housewarming party, my husband and I turned to each other and smiled, as we knew we picked the right house. It was nice being able to chat with everyone, have food available on the kitchen island, and have the dining area in arms reach so that people could sit at the table and eat, or choose to sit in the living room on the coach. Comfort was key, and we feel we achieved this with our home. Fast forward almost four years, and we were getting ready to welcome our first child. And, then the next year we welcomed our second daughter. It might sound silly, but our house finally felt like a home when we brought the girls home. But, as we grew, our space has gotten smaller. Who knew that our house would go from looking like a single couple's pad to a daycare. :-) Wherever you turn in our open area space now is filed with kitchen sets, toy chests, book cases and small toys. While the space is still function -- this time as a play area for the girls -- it still works when people come to visit, as we don't have to worry about leading people into the dining room, run to the kitchen to check on food cooking, or find ourselves going back and forth putting the girls' movies or television shows on. The open space really does work, and is truly functional. You never really worry about lighting unless a light bulb goes out. But, after being sent a 4-pack of GE Lighting’s New Reveal® Light Bulbs, I couldn't help but notice the difference. "Target now features a new lighting section including GE reveal® premium light bulbs. The reveal® bulbs are known for transforming rooms by removing the dull yellows of standard soft whites and instead providing beautiful clean white light that help the colors (and everything else) in your home to pop. GE Lighting also just released a new LED version that you can find at Target. You’ll be amazed at how GE reveal® bulbs replace yellow, dingy lighting with crisp, white light that makes colors and patterns pop, transforming homes from ordinary to extraordinary with just the flip of a switch. GE’s new and innovative reveal® LEDs offer the same aesthetic benefits as the rest of the GE reveal® brand plus energy-efficient technology that allows them to last over a decade, based on three hours of usage a day." Not only did the Reveal® Light Bulbs leave our common area in the house with clean, beautiful light, but I was happy to learn that the bulbs themselves use 28% less energy. By using these 4 GE Halogen technology Reveal® Light Bulbs, we would be spending an estimated $6.38 in energy costs a year. Not bad when you see how these light bulbs offer a crisper, brighter light. While many of us don't have the extra money to renovate our house, add on to give us more space for family and friends to meet, or just re-do a space so that it is more functional, we can revamp our favorite rooms just by switching out our light bulbs. I know what you are thinking..."You need more than light bulbs" to turn a drab room into a brighter, more full of life room? 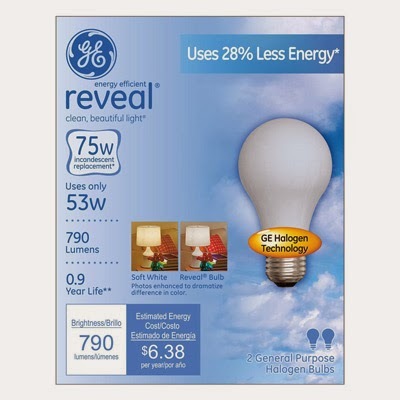 Well, give the Reveal® Light Bulbs from GE a try. At around $12.00 for a 4-pack of 75W incandescent replacement light bulbs, what do you have to lose? You, too, will be amazed at the dramatic change these light bulbs give a room -- let it be a dining room, kitchen, living room, etc. So, what are you waiting for? Head on over to your local Target store and pick up a 4-pack of GE's new Reveal® Light Bulbs to try out in your house. Need a little inspiration? Watch this fun and stylish video featuring four hip tastemakers discussing the importance of good lighting and how quick and easy it is to do a reveal® lighting makeover. 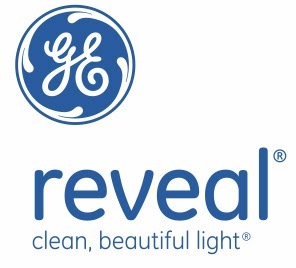 GE reveal light bulbs are now available at Target where all makeover needs can be purchased in one swoop and with great savings using Target's Cartwheel savings app. With the Cartwheel app, you can browse for savings ahead of shopping or while at Target, you can scan the barcode of any product to see if there is a Cartwheel saving. Download the Target Cartwheel app on your IOS or Android.